Yes, you read that right! I completed a card for this week's MIM: Die Cutting Partial Images, and I also managed to incorporate the color scheme for the current ColourQ Challenge #127! 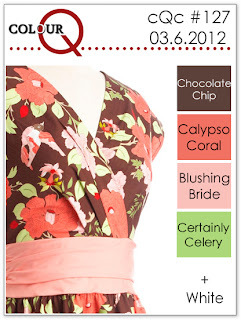 I translated the color palette into PTI's Dark Chocolate, Spring Moss, Sweet Blush, Melon Berry, and Stampers Select White. I stamped and hand-cut the peony twice, and shaded it with Copics (using techniques from this MIM from waaay back!). The frame is popped up on dimensional adhesive, and then the top peony is also popped up again on the frame. After spending a LONG time (and several rejects, lol) getting that leaf-frame panel just how I wanted it, I wasn't sure what to do about a sentiment. I didn't want anything to cover up much of the panel! Enter: Tiny Tags! Along with a Simply Chartreuse button and a bit of Dark Chocolate twine... problem solved! So, if you're interested, here is how I created the partially-cut frame panel. It was definitely inspired by Betsy's video, but I just had to use a variation on the technique to make it work for me. First I used a square Spellbinders die to die-cut 3 layers of thin chipboard, which I adhered together. I also cut the same square from a piece of craft foam. This would be the eventual size of the inside of my frame. Now I put the following sandwich on my BigKick cutting plate. Clear cutting plate, cardstock (larger than necessary, as I will cut it down to size later - easier than trying to cut it perfectly "squared up"), and then the negative space from the foam cut square. Next, I laid the dies, cutting side down, placing them how I want them to cut in my frame. Remember, the open square in the middle is to be the inside of the frame, with the leaves running through it. Next I placed my triple-chipboard-square carefully on top, so that is lined up with the open square in the craft foam. It helps to use a bit of scotch tape to hold this in position; it's going to want to shift when you crank the sandwich through. Last, to add some extra "shimming" thickness and also just help hold the sandwich together, I put about 6 layers of acetate (just the pieces that the stamp sets come on - I knew there was a good reason to save them!) on top. NO top cutting plate - this is it! Then I held the whole thing together (again, that chipboard shim is going to try to move - you want it to stay right on top of that open square, because it is taking the place of your top cutting plate, to apply pressure to the dies to cut the paper) and cranked 'er through! It worked just like I thought it would: the craft foam was just nicked a bit at the edges by the dies, but not cut through. The dies only cut the paper where the chipboard square was, hence cutting away from the INSIDE of the frame. I then used the negative space from cutting the chipboard as a guide to use a craft knife to cut out the inside frame. Then trimmed the edges uniformly, stamped the leaves, and ran through with the impression plate. Thanks so much for the inspiration, Betsy! This is definitely a cool technique, and one I am glad to have tried and hope to use again! sorry - that was a long post! :) Thanks for stopping by! awesome!! amazing job with this technique!! love it:) thanks so much for joining us this week at the ColurQ!! Gorgeous card! Love how you made it work... and definitely a nice touch of using the tiny tags for your sentiment. Such a beautiful card. And, congratulations on your shout out. Wow--that's two big weeks in a row for you. What stamp set did you pick for your win last week? Beautiful card, Debbie, love the technique you used. Thanks for joining us this week at the ColourQ and sharing your card. WOW, Debbie, you have the patience of a saint to go through all of this. However, the results were worth it as your card is simply divine. Thanks for all the details. May have to get those dies so I can try it, too! Fantastic card Debby, all the elements pull together so well, your fussy cutting is amazing. Congrats on your shout out last week. Debbie I love the way you made this card! Thanks for sharing with us. This is gorgeous, so are your other cards. I finally figured out now how to follow you again. I have been missing out on all you inspirational cards! Debbie, this is amazing!! I LOVE the partial die cut and the woodgrain impression is just the perfectly added touch. Beautiful! This is awesome Debbie!! What a gorgeous card!! Love the colors and layout. I will give this technique a try sometime thanks to your great tutorial. Yikes that's amazing. Love the look of the partial cut! I might have to read through this about 10 more times to absorb up - or better yet, maybe I should just try it. Thanks for the great ideas.